The technology company Continental is developing a flexible 5G hybrid platform that allows both: mobile network communication, and rapid and reliable direct exchange of data. These benefits are being realized with a first customer award for this 5G-Hybrid-V2X solution. Connected vehicles allow drivers and passengers access to state-of-the-art infotainment. 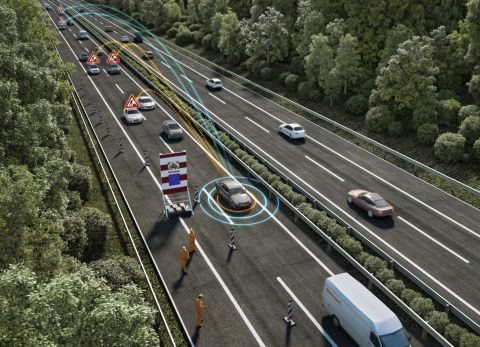 They also have the potential to communicate real-time traffic updates and road hazards, and future safety assist functions by communicating directly with other vehicles or the infrastructure, making driving safer and more efficient. To achieve this, Continental’s Hybrid V2X solution integrates technologies not only for 4G and 5G network access, but also Dedicated Short Range Communication (DSRC) and Cellular-V2X for direct V2X communication. This enables vehicle manufacturers to overcome a big challenge when deploying V2X on a global scale. Contrary to regular mobile network communication, the technical path to establish direct V2X communication varies globally. Some regions prefer the established DSRC and others lean toward the upcoming Cellular-V2X standard. With Continental’s new hybrid V2X solution, the same hardware and software platform can be used to support either communication standard, reducing not only cost but also complexity for a global application of V2X communication. Combining V2X with mobile communication results in a platform for any type of networking. During the development phase on the hybrid communication platform, all V2X requirements for the security stack, positioning and application framework were integrated with the 4G/5G counterparts. A practical example highlights the driving safety benefits of networking short- and long-range communication in one box. If vehicles approach a construction site, short-range V2X communication begins to communicate this situation within a half mile range. As a result, the driver is prepared for the situation when the car reaches the actual construction site or the end of a forming line of traffic. If seamless long-range communication also transmitted this warning with a longer lead time, the driver would be offered more options, having more time to prepare for a forming traffic jam or to get into the recommended lane, as an example. The construction workers also benefit from the advanced information as it reduces the risk of a car running into them. Based on Continental’s platform, such use cases could soon become reality on roads throughout the world. For China, this global project even marks the first series development of a V2X product. An automated vehicle will also need to process this information earlier. For example, narrowed lanes and changed or damaged traffic markers could mean that the driver must take back the driving task from the automated vehicle. In this case, the handover procedure would begin in enough time to avoid any stressful situation. “It all goes back to seamless networking, which makes vehicles a rolling local-area sensor network and adds the pivotal support of cloud-based long-range services,” Srinivasan said. With the new hybrid platform, Continental perfectly complements its existing product portfolio. Automakers will have all options in the future – from the classic single Telematic Control Unit (TCU) or DSRC solution, to the new hybrid platform. As a result, vehicles will be well equipped for all regional challenges. Continental’s plans to start series production on its Hybrid V2X solution globally in the early 2020s. At CES 2019 in Las Vegas, Continental will exhibit a live demonstrator of Hybrid V2X featuring DSRC V2X integrated within a classic 4G Telematics Unit. Visit Continental at CES Tuesday, January 8 through Friday, January 11 at North Hall Booth #7519. The Continental press conference will be held at Mandalay Bay, Level 2, Surf Ballrooms D-F at 11 a.m. on Monday, January 7. Continental will also showcase its latest automotive innovations and technologies in a private exhibit at the Renaissance Hotel. An invitation-only media event has been scheduled on January 8. Please reach out for additional information.